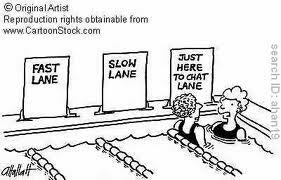 Lane Assignments - If lanes are pre-assigned to fast, medium, and slow swimmers, step one is to figure out where you fit. What is your swimming pace? My rough rule of thumb is fast about 1:30/100m, medium is about 2:00/100m, and slow is 3:00/100m. Numbers of Swimmers in a Lane - Assuming the lanes that you should swim in based on speed have no one in them, than it makes no difference which lane you choose. But, if one lane has a swimmer in it and one is empty, swim in the empty lane. Be ready to share it if needed, but don't force the swimmer that got to the pool before you did share a lane if it is not necessary. Speed and Skill Level - If the lanes you would use are occupied, watch how the swimmers in those lanes swim. Which swimmer or swimmers look like the best match for what you do when you swim? Which would interfere with you the least, and which would you interfere with the least? Is one lane doing a lot of 50s, another doing longer swims? Is one lane doing a lot of different strokes, another doing a lot of freestyle drills, and another doing straight freestyle swimming? 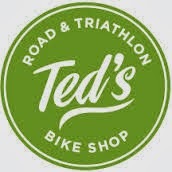 Getting in the Lane - You have figured out which lane you want to use. What comes next? Entering a Lane - Now that you have decided which lane you are going to use, sit down on the side of the pool and hang your legs in the water, off to one side of the lane, and let the swimmer(s) in the water complete a few more laps before you get in the pool. The idea is to let them know you are there - give them fair warning - and give them the chance to stop and confirm how the lane is going to work once you start swimming. Circle Swimming vs. Splitting the Lane - If the swimmer(s) stops, ask if they want to circle or split the lane (if there are already two swimmers in the lane you must circle swim, and all of the swimmers need to know that circle swimming is starting). If they don't stop, then follow the same pattern they are using. Not stopping is a breach of etiquette! Stopping for 5-seconds in a lap swim will not ruin a workout, even though all of us think it will. Splitting the lane is dividing the lane in half, with the center line on the bottom of the pool marking no-man's land. You swim on your half of the lane no matter which direction you are swimming. Circle Swimming clockwise or counter-clockwise direction. The center line on the bottom of the pool is still marking no-man's land. Swimming - Now that you know circle or split, it is time to start swimming! Pushing Off of the Wall - When you leave the wall to start swimming, be sure to give the swimmer ahead of you adequate space. Don't push off immediately after they do or you will be hitting the swimmer's feet, which is no fun for anyone - and is a signal that you want to pass them... if you want to pass them that soon, you may have picked the wrong lane. Start conservatively; give yourself time to get into the flow of the lane, and to get into your workout. On the other hand, don’t push off just before they do, if they are faster than you, they might hit you off the turn or have to pass you immediately after the turn. Choice of Swimming Stroke - If you are ahead of someone, and you switch strokes, and the results in you going slower and getting caught from behind, it may have been better etiquette for you to make that switch after the other swimmer passes you. When you change strokes, think about how that impacts the way the lane is working for everyone (yes, lap swimming with others doing different workouts can take some thought, but it works). Turning - If you are splitting the lane, how you turn makes no difference to the other swimmer in your lane as long as you stay on your side of the lane. If you are circle swimming, then you should aim for the left side of the lane as you turn and push off in a straight line. You are swimming toward the wall on the right side of the lane. When you are a few meters from the wall, shift your aim for the left side of the wall, turn on the left side of the wall "T" and push off in a straight line on the new right side of the lane. Passing Other Swimmers - Unless all of the swimmers in a lane are perfectly tuned to each other, one swimmer is going to catch up to another one. When that happens, one or two gentle taps on the foot ahead of you tells that swimmer in the lead that the swimmer behind them wants to pass (hitting that foot 20 times, grabbing it, etc - bad, bad etiquette). Lap swim etiquette is for the swimmer being passed to stop at the next wall, allowing the other swimmer to do a turn a pass them, then the passed swimmer resumes swimming (this may not be the case in competitive swim workouts - talk with the coach). It is OK for a swimmer that wants to pass to cut across a lane and change direction instead of doing the foot-tap and wall pass, but the swimmer doing so needs to be fully aware of what is happening around them so no other swimmers get clobbered! Not Lap Swimming in Lap Swim Lanes - Someone doing water aerobics, water running, socializing - not lap swimming in lap swim lanes - is a breach of etiquette during lap swim hours unless the non-lap-swimmer has permission from pool management. If that is the case, then all must be forgiven. Either way, there is not much you can do, you cannot really share a lane with that non-lap swimmer, and if the pool management will not do anything about it, you should not take matters into your own hands. Pick another lane for your swim workout. Get Your Own Gear - When you arrive at the pool, you should get your own swim gear (kick board, flippers, pull-buoy). Be sure to use only your own gear. Don't use other's swim gear; they may have adjusted the fit in advance or have a specific type they prefer; worst of all, if you use another's gear, and there is no replacement gear for them to use, a major etiquette breach will have occurred. One more lap swimming rule, not on the list, is common sense. If you would not like it to happen in your lane when lap swimming, then don't do it! Yes this is great Mark Thanks! I will pass to Jess she is going to write an article for the Post, great source!